1. Siiimple – if you need an inspiration for your next minimalistic design, then this is the site to visit. With close to 500 members and more than 1300 subscribers, you would find some great projects that could help you jumpstart your own work. 2. Wireframe Showcase has many featured designs, which are listed together with a few words from their authors, and are open for commenting as well. 3. 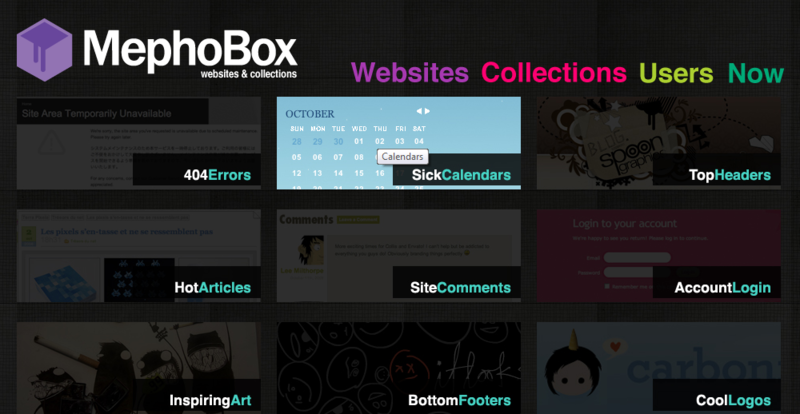 MephoBox has a good collection of designs, which are arranged in a number of categories. If you are looking for an idea for your next logo, gallery, buttons, or submit forms, then MephoBox is a great place to start. 4. Typekit Design Gallery has a web design gallery, which features sites using the Typekit fonts. 5. HTML5 Gallery – as the name suggests, the gallery displays websites, which use the HTML5 doctype and number of HTML5 elements. If you wish to design HTML5 layouts and need a few ideas, then you should head over to the HTML5 Gallery. 6. HTML Email Design Gallery – designing appealing HTML emails could be quite challenging, but visiting the HTML Email Design Gallery should steer you in the right direction. The more than 500 designs are neatly divided into one, two, and three column sections. 7. 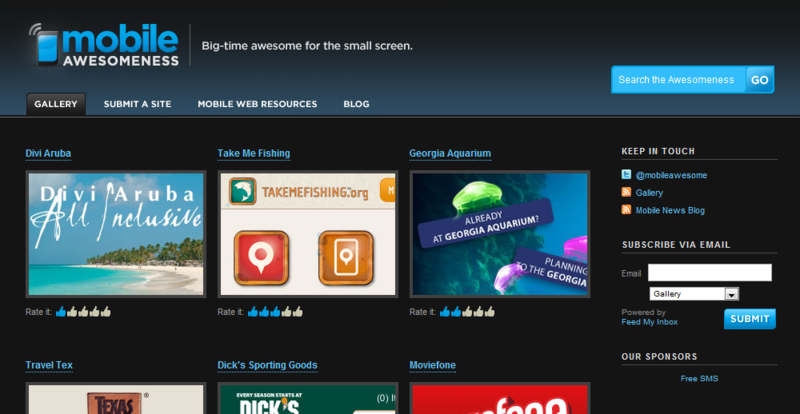 Mobile Awesomeness has a large, searchable collection of excellent mobile web designs. 8. The Drawar Design Gallery – this is a clean and easy to browse gallery, which features some awesome designs. 9. The Best Designs has a large gallery of web designs, conveniently divided into a number of categories, and a ‘featured’ page, where the best of the best are displayed. 10. Screenfluent lists nothing, but the top designs from around the World. New sites are added daily and the collection is easy to browse. 11. 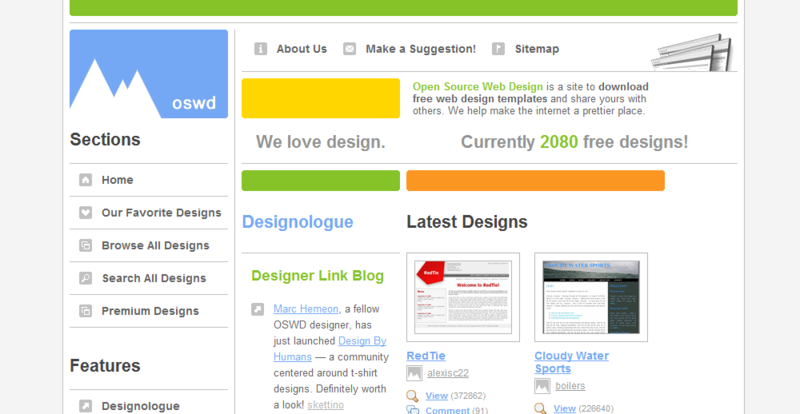 Open Source Web Design – here, you will find templates, which you could download and use free of charge (premium templates are available too), or you could simply browse and search the collection when you are on the hunt for new ideas. 12. One Page Love – with the popularity of the mini-sites growing by the minute, this is one of the few places that showcases beautiful one-page designs, and where you could draw inspiration from. 13. We Love WP – now that WordPress 3.1 is out, you are likely to find yourself designing even more websites that are powered by this popular blogging platform. With designs in 16 categories and archives going back to the 2008, this website has a lot to offer. 14. Design Snack has some extremely beautiful designs and allows the visitors to save their favorite ones and vote on each of the entries. 15. Web Crème is a site, which is quite popular with many designers, has a very large gallery, and archives that date back to 2005. The visitors could easily search the designs by color or by date. As always, please feel free to share your favorite web design showcase with us in the comments.